WOW! is the reaction you will get when tasting this sauce, 12 oz Bottle. Chipotle BBQ Sauce (Hot!) We use chipotle peppers as the main flavor in this super spicy sauce. 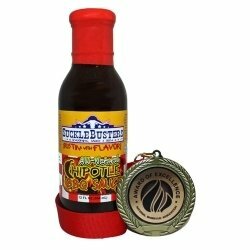 If you like it hot - you will love this BBQ Sauce! If you like it bold - you will love this sauce! WOW is the reaction you will get when tasting this sauce. The heat is balanced with tangy and sweet. The sauce is made with a base of pure chipotle peppers (no tomatoes) and is naturally hot and smokey. Excellent on chicken, beef and pork. It makes a great finishing sauce on fish as well. If you are looking for bold taste and heat, this is it! All-Natural, all good, this sauce is the chipote bomb in a bottle. Ingredients: Sugar, Vinegar, Chipotle Peppers, Water, Tomatoes, Onions, Salt, Molasses, Spices & Xanthan Gum. NO MSG. No Gluten.